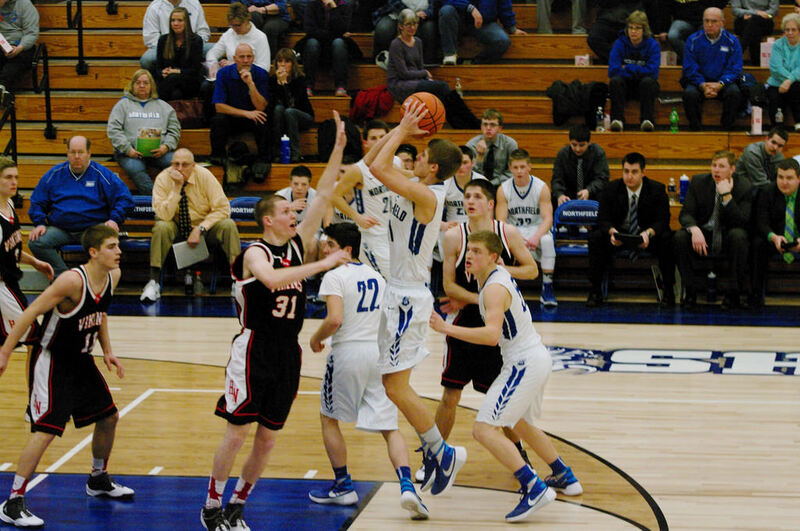 The Northfield Varsity Boys’ basketball team defeated a 15-7 Huntington North squad 58-54 last night. Leading the way for the Norse was Noah Shear with 18 points and 6 assists. Also scoring for the Norse was Kyle Reed with 12 points and 7 rebounds, while Cody Holmes added 9 points and 6 rebounds. Ryan Driscoll added 8 points while Jake Schuler stuffed the stat sheet with 5 points, 4 assists, and 3 rebounds. Rounding out the scoring for the Norse was Austin Trump and Joe Halderman who each contributed 3 points. The Norse finish the regular season on Friday when they take on Oak Hill on the road. We need your support come out and cheer loud as we prepare for sectional. The Varsity tip-off is at 7:30! The Northfield boys JV team lost 16-66 to Huntington North last night. Leading the way for the Norse was Nate Drancik with 9 points. Also scoring for the Norse was Daniel Driscoll and Logan Peas each with 3 points, while Jared Peas and Cole Rosen rounded out the statistical effort with 2 rebounds and 2 steals respectively. The Norse are back in action on Friday as they travel to Oak Hill to take on the Eagles for a 6 p.m. tip-off.